The key goal of Meath County Childcare Committee is to coordinate the implementation of National Childcare Policy at local level on behalf of the Department of Children and Youth Affairs. to coordinate and assist the development of quality childcare services. to implement DCYA-funded schemes at local level. to administer grant applications and oversee the implementation of DCYA-funded schemes. to coordinate the provision of accredited training and in-service training for childcare. to provide information and resources for childcare providers, parents and the general public. to promote inclusion of children with disabilities, and children from ethnic minorities including children from the Traveller Community in childcare services. 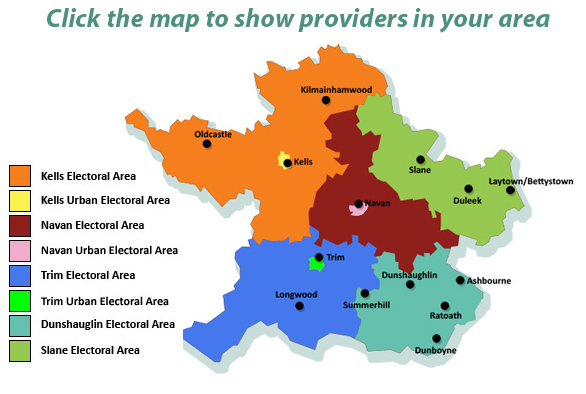 MCCC committee comprises of local representatives from the statutory, community and voluntary sectors, social partners, childcare providers and parents in County Meath. Parents!! - See Childcare Service Providers in Your Area! Childcare Providers!! - Register here for inclusion in our Database!